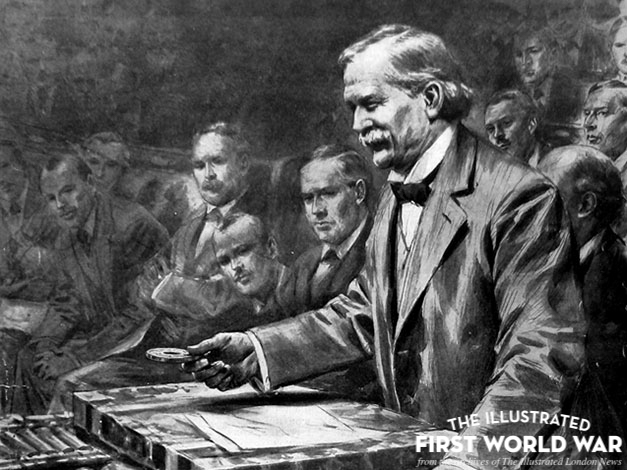 David Lloyd George, as Minister of Munitions, shows an explosive fuse to the House of Commons. Making sure Britain had enough ammunition was a major logistical and political challenge of war. The Ministry of Munitions was created to solve this. By early 1915, the demands of long-term warfare had created a shortage in the supply of explosive shells and other essential ammunition. Military failures such as the Battle of Aubers Ridge were blamed on this. Known as the “Shell Crisis of 1915”, the issue was widely reported in the press, and brought huge criticism on Herbert Asquith’s Liberal Government. Among other political upheaval (including the formation of a new coalition government), David Lloyd George was put in charge of a new Ministry of Munitions, to solve the supply problem. Lloyd George had previously been Chancellor of the Exchequer, and was already regarded as a competent, powerful politician. In his new ministry he demonstrated his abilities, re-organising and co-ordinating the production of munitions on the home front. The problem was political as much as logistical. With workers fighting at the front, shell production was hampered by a labour shortage and wage inflation. Production lay mainly in private hands, and the army struggled to find regular and reliable suppliers. By increasing state control over production, negotiating with trade unions and facilitating the employment of women in munitions factories, Lloyd George was able to resolve some of these problems. It was remarkably successful and by the time he moved on, the production time of some items was down from one year to three weeks. His success in this greatly enhanced his reputation as a capable wartime leader. The Shell Crisis was one of several tumultuous episodes for the Liberal Government during the war. The following year, Prime Minister Asquith was again under criticism for his ideological reluctance to bring in conscription (which was eventually introduced). A final crisis occurred in 1917, when Conservative coalition partners and backbencher Liberals rebelled over Asquith’s leadership. With Asquith’s resignation, Lloyd George became Prime Minister in December 1917. Though he enjoyed significant public popularity, this event caused a deep rift in the Liberal Party, from which it never recovered.